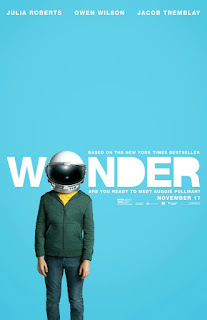 While I loved R.J. Palacio's novel of the same name I was trepidation about the film adaption. "Sick kid" movies can suffer from a high level of sentimentality and schmaltz which make them difficult to take seriously. So I was pleasantly surprised upon viewing the film that yes it falls into all the same tropes but the strong performances of Jacob Tremblay and Julia Roberts along with the charming direction by Stephen Chobsky, make Wonder truly wonderful to watch. The story of Auggie Pullman may be about a boy whose face is different from the average, but neither the book nor the movie focus on his health issues. We are to assume he is completely out of the woods when it comes to physical ailments. Instead Wonder is more of a universal outside story. Being seen as different and being called out for it is the main point of the story, not just Auggie's journey but that of his parents, sister, and friends, all being identified as different due to their connection to Auggie. There is a danger in these sorts of films of infantalizing disabled folks by making us pity them. Auggie is nothing to be pitied here. He is a fully rounded character who gets to be honestly human, as does the equally strong Via played by Izabela Vidovic. Wonder, like the novel it is based on, will be the kind of film that will appeal to almost anyone by not condescending or being overly complicated. Like the novel, the film plays equally well to children and adults. It is accessible for kids while remaining engaging for adults. While Wonder's themes are a bit heavy handed, they are handled in such a welcoming, charming way that it doesn't feel like bitter medicine. Chobsky has pulled of quite the feat here, a real crowd pleaser that is purely entertaining. He holds back the sickly sweet tide and just allows Auggie's story to unfold so that we can just go along for the ride.